At Aruna Seth, we’re bound to say bridal shoes are the most important investment a bride can make for her wedding day. We’re right though as shoes are highly associated with old weddings traditions if you look-back through history and different cultures. Coins and shoes...have a long history in many wedding traditions across the world because they symbolise prosperity, love and unity. Placing a silver sixpence coin in the brides left shoe became part of wedding tradition in Victorian times; the coin would come from the bride or father in the hope it will bring the marriage a lifetime of wealth. Sweden developed its own version of the ‘shoe-coin’ tradition, in the 19th century Swedish brides received a gold coin from their mother and a silver coin from their father placed in their shoes to ensure prosperity. In Germany, a old tradition is to collect pennies for years before the wedding to buy shoes for the bride with the money collected; if all brides encouraged family members to save their pennies, no Aruna Seth shoe would be out of budget for a bride’s big-day! Stealing shoes...traditionally bridal shoes bring plenty of fun, amusement and mischief to a wedding day due to a mixture of shoe stealing and hiding. In India, one tradition entails stealing and hiding the groom’s shoes on the day of the wedding by the bride’s sisters and cousins. The groom has the remove the shoes during the ceremony and the Bride’s family makes an off the wall plan to steal the shoe and hide it whilst the groom’s family tries to protect the shoe. 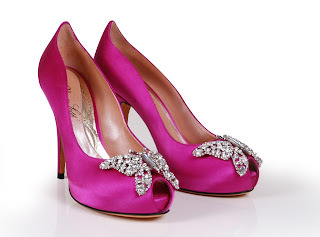 Usually the bridesmaids successfully steal the shoes as it is a matter of their pride and honor. Once the ceremony is over, the groom needs his shoes back so along with his family they start searching and the bridesmaids surround him and ask for a huge sum of money which the groom pays to get his shoes back. In Russia the ‘stealing-shoe’ tradition is carried out in reverse; at the wedding reception after the first dance it is a custom for the bride to be ‘stolen’ from the reception crowd and when the groom starts looking for her a ransom is requested. Usually it's the groom’s friends who "steal" the bride, the bride's friends add dilemma to this tradition as it is custom to steal the bride's shoe and order a ransom from the groom to receive them back. The Bouquet, single ladies and shoes...in the US and UK it’s a tradition to toss the wedding bouquet into a gathering of single female friends and relatives to offer good-luck; it is believed the person who catches the bouquet will become the next to marry in the future. The custom of the bride throwing her bouquet over her shoulder to see who caught it was originally a shoe thrown over the shoulder until it changed to flowers. In Greece unmarried friends of the Greek bride write their names on the sole of the bride’s shoe; the girls whose names are not rubbed off at the end of the evening are supposed to get married themselves within a year. In Colombia, brides marry in long white wedding dress and during the wedding reception all single persons put one of their shoes under her dress; the groom then chooses one shoe from underneath this dress and the owner of this shoe is given good fortune to marry next.